This collaboration with the NuLawLab models an approach that links archival materials, datasets, and narratives by augmenting textual data with location information and archival materials, including Boston Globe photographic archives. Working with a landmark desegregation case, this project enables the BRC to explore ways of situating important textual documents both historically and culturally. The BRC and NuLawLab teams have developed a prototype reading interface that annotates the text of the 1974 Morgan v. Hennigan case with links to archival items. Read more about the pilot processes and outcomes here. In a joint effort between the Northeastern University Archives, the NuLawLab, and the BRC, this project is focused on exploring the social and historical materials at the center of major legal cases in Boston related to race equity and desegregation. The BRC and NuLawLab teams have developed a prototype reading interface that annotates the text of the 1974 Morgan v. Hennigan case with links to archival items. The project prototype can also function as an instructional tool for law students, highlighting the interconnections between social and legal histories. 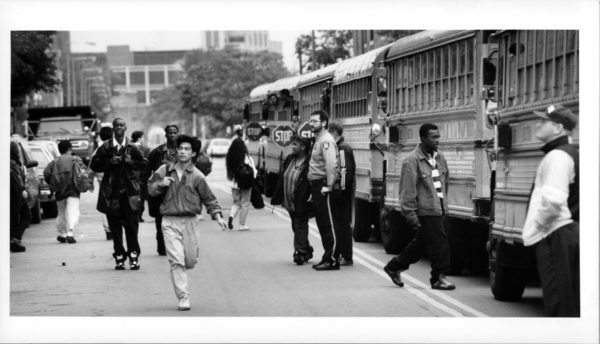 Additionally, this project provides insight into the context of the case at the center of ongoing conversations in Boston surrounding school busing and racial equity in public education. The BRC prototype is focused on the landmark 1974 case Morgan v. Hennigan that initiated redistricting and busing policies that greatly shaped the city of Boston. The project team has worked to identify and categorize a range of archival materials related to the case, including those digitized by Northeastern and by other institutional archives. Researchers annotated the text of the case with these resources, with links and brief explanations of their relevance for the persons, places, institutions, texts, events, and other entities in the document. While the prototype’s annotations are hand-curated, they allow the BRC team to explore the potential of automatic or partially-automatic archival annotation, based on items’ metadata. For example, annotations could link to all of the photographs or archival texts whose descriptions or subject categories include the names of entities in a document. The NuLawLab and BRC teams can also use the process of developing this prototype to consider possibilities for more robust and complex textual annotation and archival exploration systems and for allowing readers to collect and annotate their own sets of archival materials.